Thanks to my friend Marisa, this morning I got to go on a free Audubon Eco-Cruise down the Hudson and lower New York Bay. The picture below is of Swinburne Island, one of two man made islands created in the 19th century to house and dispose of victims of contagious diseases. 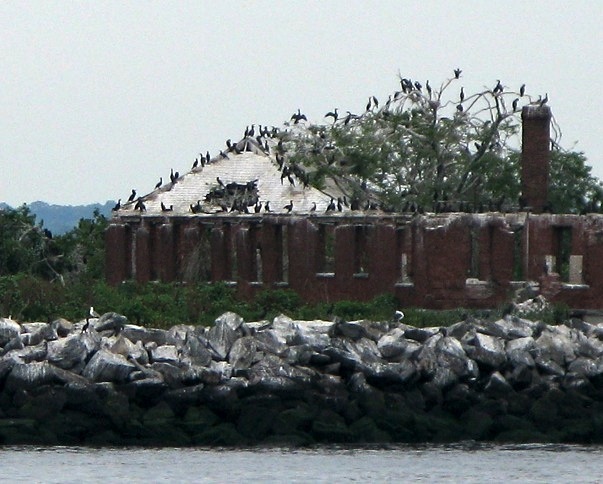 The birds are sitting on the remnants of the crematorium. So apparently those guns and swords not that far down, if anyone wants to try to recover them. I wonder how many feet of mud is covering everything. Also, seriously? New Yorkers were killing each other with swords in the 1930s? I could actually look this up, I spent weeks at the Municipal Archives copying sections of the police department annual reports going back to 1860. Okay, I just pulled them out. When they reported “cuttings” or stabbings, they didn’t specify weapons, alas. Fascinating! I suspect you will never have to worry about dementia. You are constantly putting new stuff in your brain.